CEC Chronicles since its creation on 29th May 2008 has been a major source of information and news about College of Engineering Chengannur for the alumni, students, staff and its well wishers. Reaching the milestone of 1000 days is without any doubt a huge achievement for any campus blog, and it wouldn’t have been possible with out the support and encouragement of the visitors and dedicated readers . 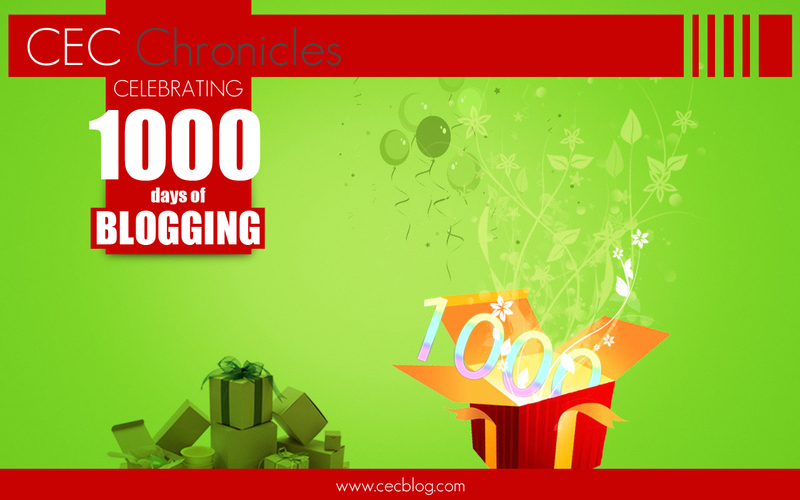 So we bloggers at CEC Chronicles is planning to celebrate the 1000+ days milestone, and also to use that occasion to invite more students to the campus blog. So please post your ideas as comments or mail to hsps9.99@ieee.org . CEC Chronicles – The Vibrations of CEC…an Unofficial Blog for CECians completed 600 days of logging CEC! This entry was posted in Blogs, Website, WORKS OF CECians and tagged 1000+ days, authors, CEC Blog, CEC Chronicles, Celebrations, Invitation. Bookmark the permalink.